Wilder rider, our circular monorail. A climbing frame, great for developing upper torso strength as well as eye-hand and eye-foot coordination. High/low rope, great for balance made from vandal resistant wire rope. Challenge your opponent with our Arm twister. Practice your balancing skills with this skateboard on a spring. The Whirl-i-gig puts a new spin on rotating type playground equipment. When A.J Grant first opened its doors, playgrounds were a patch of grass with a set of swings, a slide and a see-saw. Now, 60 years on they are a place of fun and adventure, providing opportunity to test children's skills, build confidence and develop motor skills and coordination. Our playground equipment is robust using long-lasting materials such as powder coated galvanised steel and rotationally moulded plastics. What we make, we make to last. Our clients include many schools and local authorities who recognise the need for strong, durable and safe play equipment. PLAYGEAR™ adventure playgrounds can be designed to suit your budget and space requirements. We offer a range of platforms which can be raised to a variety of heights and be used to support a range of slides and chutes. They can be accessed by our exciting range of climbing equipment, which varies from a basic ladder to our crazy Corkscrew Climber. We also manufacture and install Fitness/Commando course's and also popular is our custom made a traditional flying fox where children have endless amounts of fun gliding along the high strength cable, while comfortably sitting on a pommel set.....suitable for all ages. 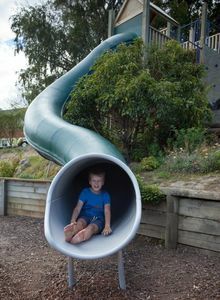 Playgear™ Early Childhood range, includes an exciting selection of slides, swing bridges, climbing equipment, tunnels, bars and flying foxes. The emphasis is on easy access but with enough challenges to develop confidence and coordination. Our early childhood swings have proved popular with both pre-school centres and home users all over the country. We also have a wide range of Junior and Senior swings to choose from. These swing frames can be fitted with a range of swing seats, from durable belt seat to our special soft cellular foam seat. Slides in playgrounds have always been a source of excitement for children of all ages. We have an excellent range of top quality slides in all sorts of styles and configurations. We use top quality materials including stainless steel, fibreglass and polypropylene. Be it basketball, soccer or rugby, our experience in building play gear has translated well into building tough sports gear for New Zealand school and council playgrounds and gymnasiums. We use a combination of durable materials including galvanised steel and top quality netting. See our wide range of sports goals available including different options in our Rugby/Soccer Goals and Regulation Indoor Soccer Goals and Net.